GR programs download warning information for the entire nation. All statements pertaining to a warning are available by clicking on the warning outline in the radar display window or by right-clicking on the warning's entry in the Active Warnings Window. The State and County columns show the location of the warning. The Expires column shows when the warning is scheduled to end. GRS applications continuously monitor the warnings and subsequent special weather statements to keep this information up to date. To automatically switch to the Nexrad site closest to a warning, double-click on it. 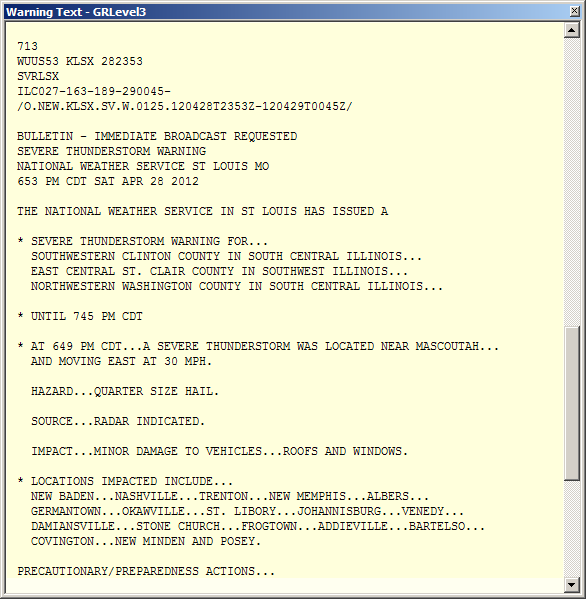 To view the text for a warning: right-click on it in the Warnings window or click on the warning outline in the radar display window. The text is continuously updated as new information about the warning is received. Selects the warning server used. When the server is changed, all existing warning information is discarded and information is loaded from the new server. Sets the color and width of the lines used to draw the warning outlines. Click on the line sample button to change the line style.